1) Can be attached to C, D, E series of SPS/ B1201M Bartack M/C. 2) Sewing can be conducted together with punching, thereby increasing productivity. 4) Supports a wide range of punching hole sizes to handle different hat hole sizes. The punching plate can be easily replaced. To prevent accidents caused by wrong operation, the emergency stop switch is placed in consideration of easy detection. Various functions are offered with icons and can be easily set with one-touch operation. First-time users can easily operate the device. Up to 26 patterns can be saved in the memory. The registered patterns can be compounded into up to 30 sets with two function keys. Quick operation is guaranteed. CF card enables the savings of high volume of patterns. Ushing the button while sewing immediately reverses sewing, and pushing the button A once stops the needle-up, and pushing twice does the needle-down. So, there is no reason to manipulate the pulley. In case where backtack is required during sewing, backtack is carried out by stopping the machine and touching the button B once. With respect to thread trimming after backtack, pushing the button B once and trimming carries out trimming without backtack. The trimming mechanism is devised to adopt special material-used movable/fixed mes to increase wearproof and durability and facilitate the adjustment of trimming power. The saw teeth horizontality adjusting device designed to control finely the slope of the saw teeth ideally maintains always saw teeth horizontality to guarantee fine, elegant sewing. The synchronizer built in the pulley has more simple and easier adjustment feature. More highly and longly extended space is not limited by the size of sewing materials, so it guarantees more efficient work. Pressure dual control system of presser foot and easy regulation of ascending amount of both main presser foot and auxiliary presser foot by dial are suitable for various sewing conditions such as the work for the different thickness material. With applying reliable feed mechanism, firm stitches and best quality are guaranteed. Compulsory circulation type automatic oil supply system by pump enables the machine to have dignity as perfect sewing machine owing to its highly improved anti abrasion. General materials: Zigzag stitching for underwear, clothes, and trousers Heavy materials: Zigzag stitching for shoes, gloves, and bags. The upper blade made of special alloy and the lower blade equipped with carbide tip enable the high quality cutting of various sewing materials. 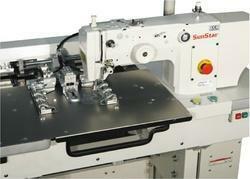 Powerful unison feeding mechanism can guarantee good stitching quality. The accurate movement of the upper feed and the feed dog can resolve puckering and slipping depending on sewing materials. - The machine has strong up-feeding drive especially for one-time sewing from general materials to ultra heavy ones. - Simple easy control mechanism of stitch length reverse sewing function. - It realizes excellent working for round-type sewing by its cylinder-type bed structure, and enable us to choose the type of cylinder bed according to the size of sewing machine. - Safety Ball-Clutch mechanism prevents sewing machine from being damaged for over drive. The fully automated lubrication system has enhanced durability. The lap lift is easy to install and reduce operation overload, thereby enhancing productivity. 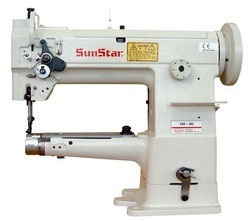 Since the easy-to-operate upper feed adjusting system was adopted, the one-step sewing can be conducted conveniently. The length of stitches can be adjusted simply by turning a dial. The upper/lower feed volume can be accurately controlled. The sewing machine was designed in consideration of various sewing conditions from medium materials to ultra heavy materials. 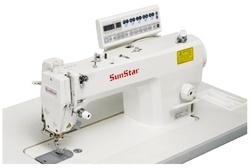 The adoption of upper/lower feed mechanism addresses the shortcoming of the slippery separation of sewing fabrics when a vinyl material is sewn together with a fabric and ensures powerful feeding. The presser foot can be lifted up to 14 mm. As such, sewing heavy materials can be conducted conveniently. It has the reverse feeding system so that reverse sewing and shrink sewing can be conducted by adjusting the reverse lever only. - It is a single needle, cylinder bed sewing machine with alternating pressers in addition to a compound feed, reverse stitch mechanism. - Compound Feed : Drop feed, walking foot synchronized with needle feed. - The powerful feed mechanism perfectly eliminates slippage of the upper and lower pieces of material, and enhances the appearance and quality of the products. 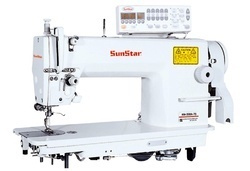 - Stitch-length adjustable up to 6mm by Dial : Reverse sewing lever is large to operate easily. - Simple screw adjustment permits raising and lowering of center foot as required for different thickness of material. - Small-dia. (46mm) Cylinder bed : This makes it so easy to feed bag, shoes and other small products. - Positive semi-automatic lubrication by the vibration of machine. The bobbin winder attached to the upper part of the machine can be used to wind the lower thread. The adoption of large hook makes frequent bobbin exchange unnecessary during sewing, thereby enhancing productivity. The Rotary Mes-type thread trimmer is simple in structure and easy to use. 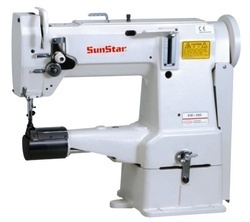 Direct Drive System, newly developed by SunStar, means the motor is attached to the machine head directly. 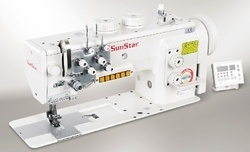 As the system connects the AC Servo motor to the upper shaft using the coupling, the machine provides improved responsiveness and upgraded stopping accuracy so it is optimum for high quality sewing. The machine operation and emergency switches are located at the same place, so that their prompt and convenient use is possible. The adoption of the gantry type X-Y mechanism guarantees easy maintenance and reliable X-Y feed. The Y-rail guard and the dust screen can protect the user from accidents and prevent damage to the Y-rail and the Ytiming belt. 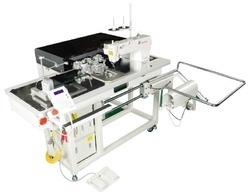 Due to the use of a hole-locating pin for the accurate positioning of the sewing materials, the machine enables the user to work more conveniently with the increased productivity and sewing quality. 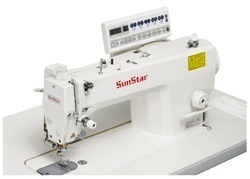 3) Guarantees high-quality sewing work with neat punching and accurate feed. Various functions are offered with icons and can be easily set with one-touch operation. First-time users can easily operate the device. Up to 26 patterns can be saved in the memory. The registered patterns can be compounded into up to 30 sets with two function keys. Quick operation is guaranteed. CF card enables the savings of high volume of patterns. Low noises and low vibration at the maximum speed. Enhanced machine durability. Especially suitable for heavy materials. Wider working space increases productivity. The thread adjusting device is able to control the tension of left and right upper threads separately. In any condition, clean and high-quality sewing is guaranteed. Synchronizer installed in pulley is more simple and adjusted easily. Because the Mes is structured to offer a long-life. Plane surface action capable of perfectly cutting thin or thick thread, no Mes re-adjustment is required at all when stitch lengths are changed. 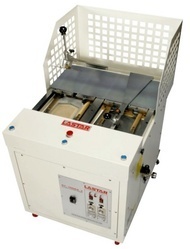 The unique thread-trimming mechanism has simple design and easy control system. The high-performance impeller pump is used to enhance durability of the internal moving section of the sewing machine. guarantees strong cutting power increases abrasion. And durability with special material of moving and fixed knife, threadtrimming super heavy-materials is perfect because of cutting power control. The thread take-up made of special aluminum enables quiet sewing even at the maximum speed. User convenience improve Feed dog and needle transport seweing material at the same time the mechanism minimize streching of clothes and puckering in highvalued materials and synthetic fiber. A number of accessories are offered to improve productivity.The Soft-touch reverse button and the attachment sheet. pressers inaddition to a compound feed, reverse stitch mechanism. - Unison Feed : Drop feed, walking foot synchronized with needle feed. and quality of the products. Sewing speed can be adjusted in seven steps from 2,000spm to 3,500spm depending on the presser foot overlap volume. Therefore, the product durability and work performance have been enhanced. If sewing material has height difference between the left and right side, the upper thread tension can be differently applied to the sewing material by using a switch. This provides the optimized sewing condition. The reliable pneumatic trimming mechanism has enhanced trimming performance. 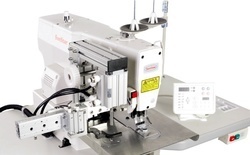 The sewing speed can be automatically controlled in line with stitch length. This has maximized product durability and safe operation. The 2.5-fold large hook reduces the frequency of bobbin replacement, thereby enhancing productivity. 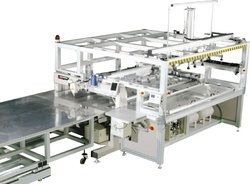 The broader working space, which is 335mm long and 120mm high, enhances work efficiency and handles large-size sewing materials in an easier manner. The two stitch count dials are set at different stitch counts respectively. In the middle of sewing, using the stitch count change, stitch count can be easily changed. The seam center presser foot creates accurate seam condition during the 2-line standby process. feature has improved durability and work convenience of the machine. If a sewing material has different thickness between the left and right side, the upper thread tension can be differently applied to the left and right sides by using buttons. This provides the best sewing conditions. The reliable pneumatic trimming mechanism has enhanced the trimming function for a variety of thread types. The 172mm post has secured a broader working space, thereby contributing to productivity enhancement and better work convenience. The presser foot applied with the seam center guide prepares the accurate seam conditions for the 2-line parallel sewing process. The use of a 1.6-fold large hook has reduced the frequency of bobbin replacement, thereby contributing to productivity enhancement. After setting different stitch counts in the middle of sewing work, stitch count can be simply changed by pressing the stitch count change switches. 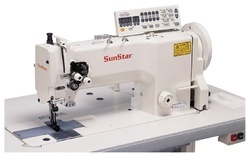 Equipped with 750W servo motor which shows the largest torque in the same class, the sewing machine can perform the heavy material sewing in the easy manner. 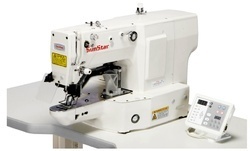 The stitch length-based automatic sewing speed control has improved the safety of the machine operation. The lap switch for presser foot overlap volume change enables the overlap of the main and subordinate presser foot simply adjusted during the sewing process of the materials with significant thickness difference. Through the dial installed on the top cover for convenient operation, the waking foot and presser foot’s alternating vertical movement(1~7mm) is easily adjusted to use. Also the sewing speed is automatically adjusted by the default so that stable sewing condition can be kept all the time. Considering the sewing for heavy materials such as car-seat, bags, and sofa, the machine realizes smooth and powerful feed mechanism. So, stitch in over-lapped section sewing having uneven thickness as well as in high speed is guaranteed. Making a great contribution toward productivity improvement, the presser foot lifting operation(16mm) by the presser foot lifting devices of pneumatic style reduces an operator's fatigue by its simple pedal operation. Maximizing productivity by adopting Horizon 2.5 fold Hook. 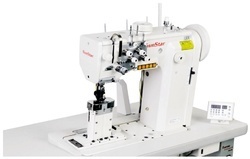 Since the easy-to-operate upper feed adjusting system was adopted, the onestep sewing can be conducted conveniently. The length of stitches can be adjusted simply by turning a dial. The upper/lower feed volume can be accurately controlled. The presser foot can be lifted up to 14mm. As such, sewing heavy materials can be conducted conveniently. By adopting vertical large hook, the time for bobbin change is reduced with maximum productivity. The pneumatic table open/close system enables easy bobbin replacement. This has enhanced work environment. - The pneumatic table separation system enables easy bobbin replacement and oil injection. This enhances the work environment. - The automated pneumatic palette replacement system realizes convenient work environment and reduces palette replacement time, boosting work productivity. A hot-wire is able to be supplied safely with the automatic hot-sire supplier. Hot-wire coil is fixed accurately to the sewing material by putting the coiling attachment which is perfect for the stitching hot-wire. enhances hook durability. The hook cooler reduces heat-generated wrong operation, improving stable production. - The 6.4 TFT Graphic LCD enhances readability and easy operation. - Stable air pressure When the air pressure is low, the digital air pressure switch automatically swifts from the pneumatic tank to the stored pressure, maintaining air pressure to be stable. - Safety facilities for users Safety detection systems such as palette detection device, emergency switches (3EA), and user alarm system automatically stop the machine operation during wrong operation. They primarily consider user safety as a top priority. 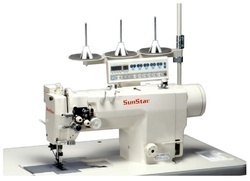 The highly efficient oil pump enables the stable sewing work at the high sewing speed of 8,000rmp. Noise and vibration prevention The optimized needle bar mechanism for 8,000rpm sewing has reduced noise and vibration. The upper looper adjusting stopper helps realize various sewing outputs. The fine differential feed ratio can be easily adjusted with the differential feed ratio device in line with a number of work conditions. The stitch length can be easily adjusted by the pulley. For productivity enhancement by reducing work cycle, HIP pocket can be designed using FORMER in advance and attached with "Pocket Setter." The setter performing this function is called "Semi-Automatic Pocket Setter." Equipped with 'X: 1Kw / Y:750W' Servo Motor, the machine does not allow as small as 0.1mm of error. This complete control supports the handling of pockets of any design. With full cross control, the X-Y feed can be adjusted at the unit of 0.05mm. This enables precise and delicate sewing, and its benefit is clearly manifested in the sewing of difficult slant lines and curves. The direct drive method was applied to the motor. Since the V-belt is not used, vibration and noises have been much reduced, and the working environment has been more improved. This can reduce fatigue of workers and boost their productivity. The clamp which does not have any clearance and motion can support the sewing materials in a stable manner and helps produce good-quality sewing outcome. By thorough study on the every mechanism related to sewing, we have finally realized marvelous sewing speed, 2,000spm. This model adopts a big sized feed frame which is good for making a design like stick and pocket. Productivity can be increased by adopting large shuttle hook and double capacity bobbin. Therefore, you don't need to change bobbin. Realization of maximum capacity Direct Drive System, newly developed by SunStar, means the motor is attached to the machine head directly. As the system connects the AC Servo motor to the upper shaft using the coupling, the machine provides improved response and upgraded stopping accuracy. It is optimum for high quality sewing. hook, the sewing area is enlarged and stable stitches are accomplished. - By Excellent X-Y motion control system, you can get a smooth and accurate sewing results and a good quality for such sections like bias or spline. The hook cooler reduces heat-generated wrong operation, improving stable production. The pneumatic table open/close system enables easy bobbin replacement. This has enhanced work environment. - The 6.4??? ?TFT Graphic LCD enhances readability and easy operation. - Serving as the operating device and the input device at the same time. is prevented. It realizes a stable sewing environment. Safety detection systems such as palette detection device, emergency switches (3EA), and user alarm system automatically stop the machine operation during wrong operation. They primarily consider user safety as a top priority. With the powerful 750W main shaft motor, the shaft driving power is sufficient to drive the large palette. The sewing machine head is independently operable. 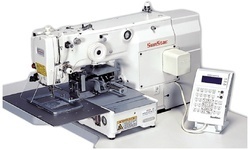 Due to automatic ascending / descending movement, the sewing scope of the machine can be easily expanded. A. Suitable for handling heavy materials. Adjustment can be made to proceed special purpose large-size sewing materials in order. The host application device and other functions can be easily applied. With the installation of the palette replacement device, it is possible to handle large cassette such as car air bag. Likewise, it can be used for various purposes. The presser foot height can be automatically adjusted depending on sewing fabric thickness. High-quality sewing can be offered even when the height of presser foot needs to be different. It makes bobbin replacement less frequent and enhances productivity. The LCD screen displays setup and program data input information at a glance. Sewing data input status and errors such as thread break can be easily checked. This way it has enhanced user convenience. As a seamless rack type, fewer breakdowns occur, and maintenance becomes easier. 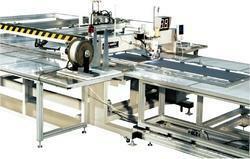 The wide sewing scope of 300mm(X) x 200mm(Y) enables the handling of various sewing materials. working environment has been more improved. This can reduce fatigue of workers and boost their productivity. 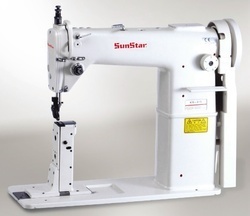 With the adoption of the 2-fold shuttle hook or 2-fold bobbin, the bobbin replacement does not need to be frequent during heavy material sewing. This enhances productivity. The all-in-one feed frame creates the feeding frame mechanism of lifting the frame by up to 30mm in the simple and efficient manner. This enables simple setting for sewing materials. 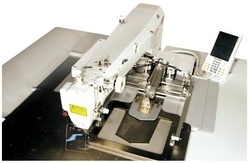 Users can easily adjust the height of Feeding Plate in line with various sewing conditions from the OP Box. The clamp which does not have any clearance and motion can support the sewing materials in a stable manner and helps produce goodquality sewing outcome. Various functions can be used by pressing icons, and the setting can be done with one-touch operation. As such, even the first-time users can easily operate the machine. 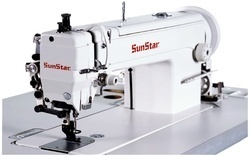 Direct Drive System, newly developed by SunStar, means the motor is attached to the machine head directly. As the system connects the AC Servo motor to the upper shaft using the coupling, the machine provides improved response and upgraded stopping accuracy. It is optimum for high quality sewing. By Excellent X-Y motion control system, you can get a smooth and accurate sewing results and a good quality for such sections like bias or spline. Sewing speed can be adjusted in seven steps from 2,000spm to 3,500spm depending on the presser foot overlap volume. Therefore, the product durabilityand work performance have been enhanced. The presser foot can be minutely adjusted through the motor. This could deliver constant sewing quality while conducting the sewing for different presser foot height. This highly sensitive sensor detects the supply status of the upper thread and any thread breaks. The enhanced main shaft motor power enables the machine to deliver constant sewing quality for assault jacket and other various super heavy materials. During the pattern line sewing, the thread tension can be partially adjusted to address stitch. Punching function assigned for necessary section. The wiper driven by and electronic solenoid is a device which makes the surfaces of fabrics beautiful in a next work. And On/Off is selectable simply by selecting the parameter. Larger Hook enables a significant working performance for heavy material. Wiper provides less friction with working material. Realization of stable sewing by holding sewing material strongly to the machine. Low noises and low vibration at the maximum speed. Especially Suitable for Heavy Materials. The rotary thread trimmer can be easily adjusted depending on the thickness of sewing materials. Remnant thread can be minimized. 445mm tall and slim post embodies the best conditions for sewing of long or tight materials. 2.5mm of interval between needle point and needle plates edge is optimized. Large-sized-pulley provides an excellent working condition for heavyweight materials. 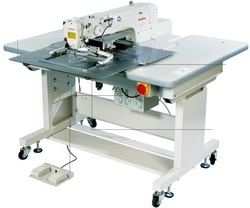 By using a inclined table, it enhance the convenience and efficiency for sewing operation. Depending on the thickness of sewing materials, the presser foot height can be adjusted. For the sewing with height difference, high sewing quality can be obtained. 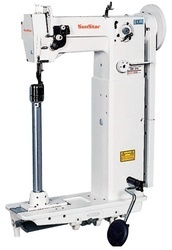 Depending on various sewing conditions of users, the feeding height can be easily adjusted through OP panel. The X-Y feed can be controlled by 0.05mm due to the full cross control. 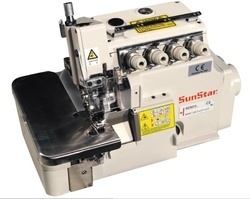 This enables precise sewing and high sewing quality. 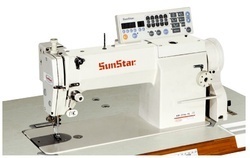 The precise control stands out during complicated slant and round sewing. The directly driven clamp structure does not allow vibration and clearance. Since the sewing material is stably secured, it shows excellent work performance. The old pocket forming machine is the rolling style while the new pocket DY-10000A is improved to the sealing style to form accurately. It is easy to stitch and gentrify the products with pressing by folding a hip pocket double; especially it is effective when forming the thick fabric like jeans. DY-10000A-2 is the double head type so it is possible to prepare the one side operation during pressing of the other side.